Ideally located in the heart of Cairns, the Shangri-La Hotel overlooks Marlin Marina, Trinity Bay and the green mountains that frame this jewel of a city, famous as a jumping-off point for the Great Barrier Reef. The hotel, which recently completed a comprehensive AU$35 million redevelopment is a 10-minute drive to Cairns International Airport, a moment's walk to the Cairns Convention Centre, and a short stroll to the Esplanade Lagoon, Pier Shopping, Pier Dining Promenade and Great Barrier Reef Departure Terminal. The upgraded hotel offers airy, modern accommodations with elegant furniture and spectacular views of the Marina. And with the renowned Horizon Club, Shangri-La is the only hotel in the area to offer a true five-star club floor facility. Also new is Tides Seafood & Grill, offering exquisite dining along the Cairns waterfront. Other revitalisations to the property include upgrades to the hotel suites and the hotel's meeting and banquet rooms, making the hotel a top-tier location for business and leisure travellers alike. The Shangri-La Hotel offers 255 spacious and inviting guest rooms and suites. All rooms have private balconies along with memorable views of the city, the hotel's tropical gardens, Trinity Bay or Marlin Marina. All rooms are decorated with local artworks that express the natural beauty of the Tropical North. Standard Room Features include Broadband and wireless Internet access, In-house movie channels, and Sony PlayStation game system. Coffee/tea making facilities, and Mini-bar. Full-size executive writing desk, International direct dial telephone, Independent fax line, Voice mail, and Electronic safe. Balcony with city, garden or water views. 200-threadcount sheets wtih 100% Egyptian cotton, Pillow menu, Separate shower and bath, and Shangri-La toiletries. FREE INTERNET ACCESS & FREE PARKING. Our Executive Suites have views of the City, Trinity Inlet or Marina all with a Spacious Balcony. COMPLIMENTARY BREAKFAST, EVENING CANAPES & DRINKS in the Horizon Club Lounge along with FREE INTERNET ACCESS & FREE PARKING. In Far Norths Queensland's most contemporary accommodation with Water views & Spacious Balcony. Experience the Shangri-la & Great Barrier Reef together. Includes a full day reef trip for 2 Adults on board Passions of Paradise a 25 meter sailing Catamaran, Complimentary glass bottom boat tour & A Bottle of red wine in the room on arrival. This package includes one nights accommodation in a Superior Room, A 60 minute massage for one, a $90 dinner credit per day in Tides Restaurant & Complimentary use of the gym, spa, sauna & swimming pool. Check in is at 2 pm. Reservations will be held until 4 pm on day of arrival (Cairns time) unless guaranteed by a credit card or deposit. Check-out is at 11 am. Cots for infants to age 3 will also be provided on a complimentary basis. Extra guest is charged an additional $40 per night. Undercover, Valet, and Off-Street parking available for our guests at Shangri-La Marina, Cairns. 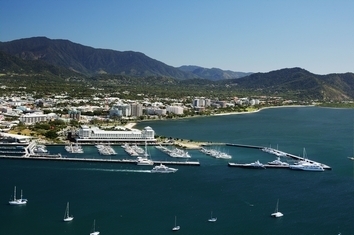 As an international port, Cairns offers the best in duty-free as well as locally-made products. In addition to a central business district and Pier Marketplace, there are five regional shopping centres close by. 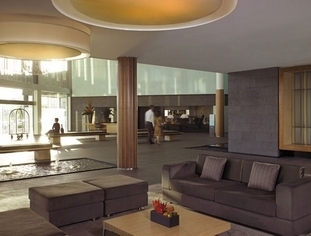 Enquire with our hotel staff regarding the best place to procure authentic and high quality goods. These lush tropical gardens specialise in gingers and palms, and has a stunning collection of native and exotic plants. Guided tours are available on weekdays, and therea re also self-guided walking tours. The on-site café is an excellent place to have breakfast. Owned and operated by Aborigines, the Tjapukai Cultural Park is a fantastic way to learn about and experience Australias native cultures. Shows are told using giant holograms and feature demonstrations of the corroboree and boomerangand also spear throwing. The retail gallery sells authentic digeridoos. The Cairns Regional Gallery is housed in a wonderful heritage building, and offers exhibits focusing on indigenous art.